Do you think that having fine hair means you can’t have full, thick looking hair? Well maybe I can change your mind. All you need is the right products and my help. I’m sure you have already tried a lot of different products that say they are the best for fine hair, but you need more then just the right product. It starts at the scalp. By having the right shampoo and conditioner combined with the right product you can be a magician that fools the eye into seeing your fine hair as thick and full, without revealing your secret. It’s sulfate-free and silicone free so it won’t weigh down your hair with oils and it removes build up gently to create fullness. Another great thing about this shampoo is it repels dirt and oil from hair to keep hair cleaner longer. How great s that?!?! Pair it with the conditioner that is lightweight and de-tangles without heavy silicone. It also has the same technology so it repeals dirt and oils so you hair stay cleaner longer. Don’t let the word oil in the moroccanoil scare you away. 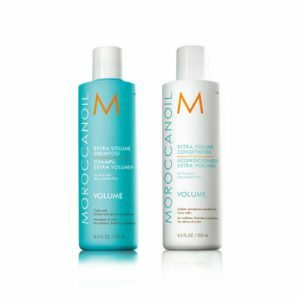 Their extra volume S & C is infused with argan oil to provide nutrients without weighing down hair. It’s not like other products that use silicone. Silicone will weigh down your hair and cause build up. It also has linden bud extract that plumps up your hair naturally. 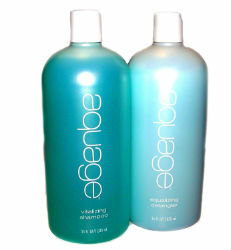 Your hair and scalp will feel clean, conditioned and lightweight after using this beautiful pair. It’s also color safe and sulfate-free! 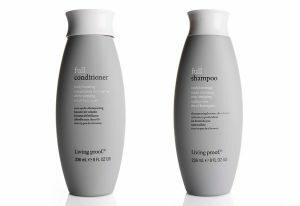 This volumizing shampoo and conditioner pulls out all the stops. I have used this for many years and got all my clients hooked on it. Your going to pay a few $$$$ for this but girl it’s worth it. Not only does Tom Ford create the scent for this luxury brand it’s infused with the highest quality ingredients. Natural sugars and coconut oil is used for gentle yet effective cleansing. High tech polymers to plump up your locks and give you fullness. This S & C is lightweight and has protection against heat styling tools. If that’s not enough bam there’s UV protection. What more do you need? You must use the shampoo and conditioner together to get results! All I can say is WOW when it comes to this shampoo and conditioner. It is specially made for hair that is thinning. It has growth accelerators that helps reduce DHT which is a cause of thinning/hair loss. This exfoliating S & C stimulates the scalp to helps promote blood circulations. 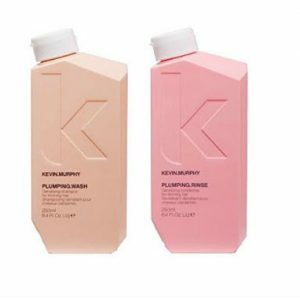 It is infused with ginger root and nettle extract to strength hair and add density. It will take a few months to see results, but good things are worth waiting for. 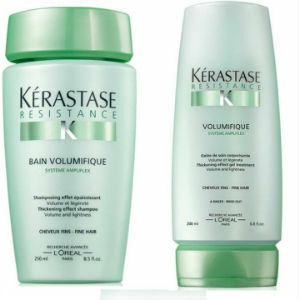 Kerastase always makes such beautiful products. Cellulose powder helps thicken hair for amplified volume. It has intra-cylane technology which provides structure and hold from the inside out. If that’s not enough it add shine and controls frizz without weighing down your hair. The conditioner may not make your hair soft because it is made to add volume. Some people don’t like this. If your not looking for softness and want volume, shine and hold give this a shampoo and conditioner a try. 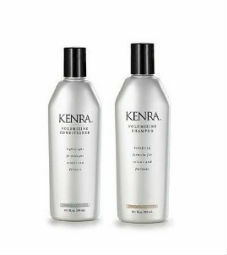 Kenra is a classic quality shampoo and conditioner that uses gentle ingredients to give your hair beautiful results. 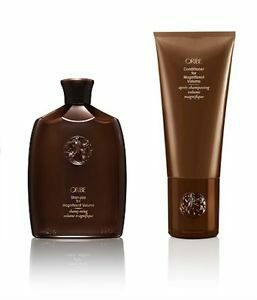 This Shampoo is infused with pro-vitamin B5 to increases the mass and diameter of the hair shaft to give your hair body. Kenra uses a sulfate called sodium myreth which is very gentle and needed to get your scalp and hair clean, but isn’t stripping of your hairs natural oils like other sulfates can be. Kenra volumizing conditioner has silk proteins to add strength and rosemary and lavender to sooth your scalp and add shine. A little extra bonus it has UV protection to help prevent your color from fading while in the sun. I love and have used aquage products for many years and I’m always happy with the results. Trust me when I say how amazing aquage products are. This pair of S & C helps maintain and restore hairs natural moisture using sea botanicals to strengthen hair and add volume to limp locks. A plumping shampoo with a lightweight conditioner that seals the cuticle and adds shine. Note: Remember sulfate-free shampoo won’t lather that much. This doesn’t mean it’s not cleansing it means it’s not using harsh chemicals to clean your scalp and hair. Some but not all sulfates can be very astringent which can strip your hair of its natural oils. For example coconut oil is a sulfate ( who knew?) and gentle on hair. Check out So That’s How You Shampoo to get the 411 on how to properly shampoo hair.